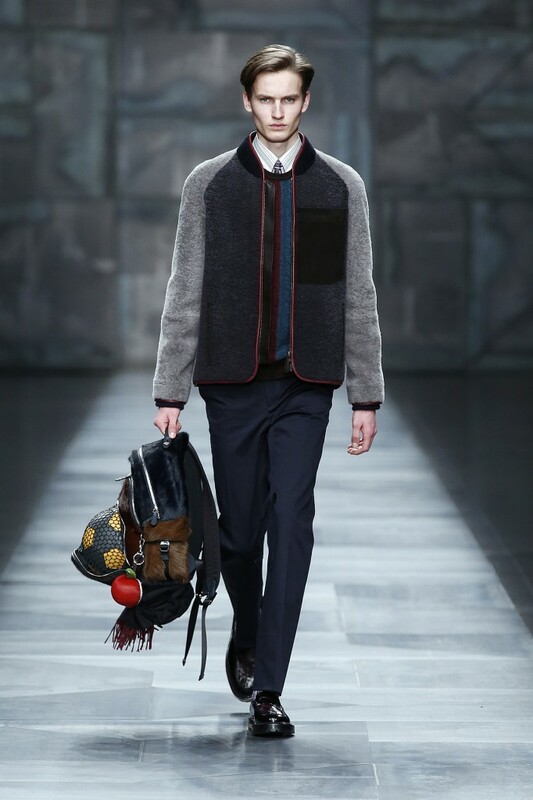 The FENDI Men´s Fall/Winter 2015/16 Collection is tailored for an urban dreamer. The collection merges lightness and precision, and features the stables of the masculine wardrobe interpreted in the FENDI way – deceiving the senses while pushing craft to the limits. The silhouettes are soft and comfortable. Tones of grey, blue, milk and tobacco build up the classic color palette. Accessories are sturdy loafers with fur inserts and felt shoppers or backpacks with straps to hold blankets. The new apple and smiley furry bag charms surprise with an ironic touch.